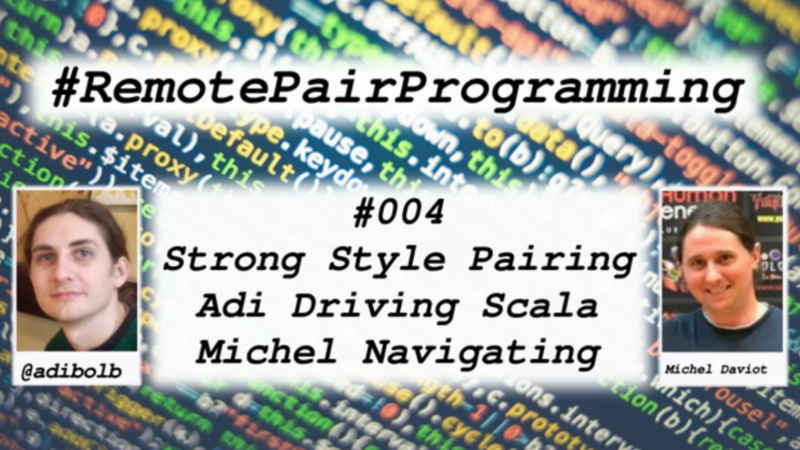 During this episode from the #RemotePairProgramming series we continue the exercise from previous episode. My coding pairing partner this episode is Michel Daviot. Question (Michel): When would you use this remote pairing techniques and pairing (like Strong Style, Farsight Navigator, etc)? Answer (Adi): When people are very used to their code, but don’t know how to refactor it, it is very useful to use Strong Style, because the Driver would know how to navigate around the code, but won’t know how to refactor or use a specific legacy code technique. The Driver knows the language, the project and so on, but the Navigator knows the techniques. With new code Strong Style is very useful when you get stuck. And then the driver took control, pushes the rhythm and the steps to have progress. Question (Michel): Do you explain to the people you use Strong Style? Answer (Adi): Not really, because just coming up with theoretical concepts up-front feels weird. I just say “let’s pair and try this”. Maybe at the end of the session I might explain. The other approach is a game called Farsight Navigator, where the Navigator looks far away for the design, and the Driver takes the small decisions. This technique works quite well, but you need to have very good Navigator skills to know where the design is going. So the role of the Navigator is to know which design options are not good and the solution would get stuck. With Strong Style the Driver doesn’t need to know anything about the code, design, direction, etc. 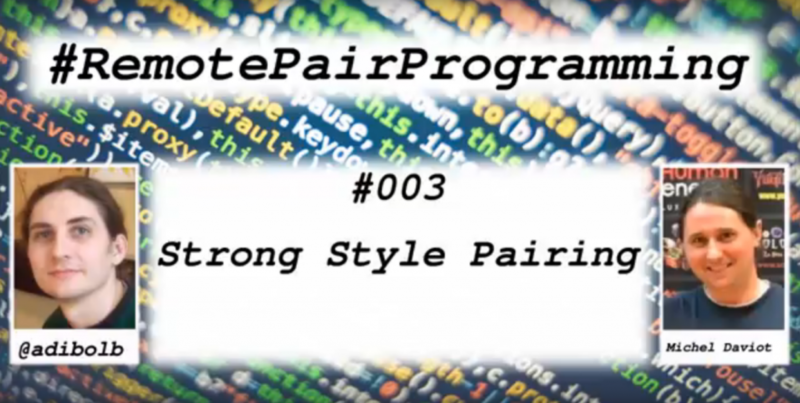 The third episode of this #RemotePairProgramming series is about Strong Style Pairing. My coding pairing partner this episode is Michel Daviot. During Episode #002 Llewellyn was the Navigator in a Strong Style Pairing way. This episode I will be doing the same, but with my style. But there is also a challenge, given by my driver: Michel. I don’t know at all the problem, and I have never heard of it. So I need to be navigating in a Strong Style Pairing without knowing the problem. So my solution is to go in small steps, to minimize the risk.